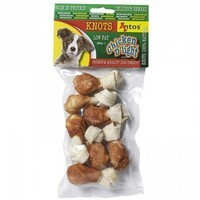 Antos Chicken D'Light Knots Dog Treats are 100% natural and delicious treats that your dog will love to get hold of. Made from high quality chicken and rawhide in clever drumstick shapes, Antos D'Light Knot Treats have a high protein content that will help your dog to stay in good health, with healthy skin and strong teeth. No artificial flavourings, colourings or preservatives. The premium quality treats come in re-sealable bags to ensure the meat stays fresh; keeping your treats fresher for longer.